I’ve been back in Australia nearly two weeks now, though it feels longer. I have been enjoying clean air, blue skies, good food, driving, time with friends and family. I even got to briefly see my youngest sister and my brother in law – an unexpected pleasure, given that we didn’t realise our time in Canberra overlapped! I’ve also been packing and sorting things to take to Sydney, and working on finishing my book. I’ve done just about everything I wanted to do. It’s been a good time. 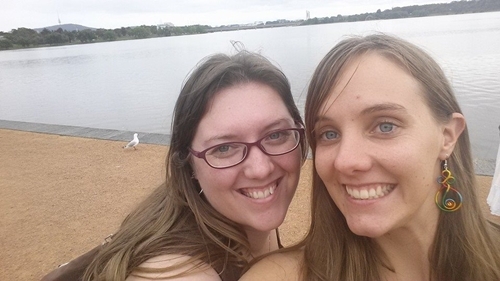 My sister’s “Canberra selfie” of us during our brief overlap. Tomorrow my parents are driving me and far too much of my stuff to the small college (and the small dorm room there) where I will be living and studying for the next three years. The buffer between ending my China life and beginning my new life here in Australia is officially over! Several people have asked me how I’ve been handling the transition to Australia, whether there has been much culture shock, but in reality I feel I haven’t actually begun the transition. The last two weeks have felt like any of the short visits I’ve made in the past few years. I’ve been at my parents’ place (and visiting my grandparents), living out of suitcases, and trying to catch up with friends during the short period of time I have available. So it really hasn’t felt out of the ordinary. But tomorrow… Tomorrow is when things will start to get real. I’m so glad to have had nearly 6 months of in-between time. I am thankful to wonderful friends who helped me do this financially (and in so doing help get the book finishing). I am thankful to scores of people who have encouraged me, often in a more timely manner than they could have realised. I am thankful for the community in Cambodia who gave me space to start coming to terms with the massive change I am in the midst of. I am thankful to people at SMBC who have been wonderful about helping me get ready to begin my time there. This time has served its purpose and then some. In the last two weeks I have thought again and again about what it was like to leave Australia for China. It is the only other transition of this magnitude that I’ve made in my life, and I made it as a naive 21 year old – I really didn’t know what I was getting myself into, but I knew I was excited to go! This time I know what I’m doing. Both time I had a sense of certainty that I couldn’t adequately explain. I knew then I was doing the best thing for me; I know I am now doing the best thing for me. I knew when I left Canberra for Beijing that it was a Real Move, a permanent change, that I was entering a new stage of life and would not be going back to where I was, or who I was, before. I feel the same way now – that this is a bigger change than I can articulate, that it is the start of a new season, that a few years from now I will be a different person living a different life. People in both China and Cambodia have said to me that they know I’ll be back. As I told them, I hope I will be. I definitely hope I’ll visit. I certainly plan to live abroad again – and probably quite soon after I finish my degree here. But I know it will be different. I will be different. And that’s a good thing. I gained so much from my 11 years as a young expat in Asia. I know I will gain a lot from these next three years studying in Australia. When I left Australia I felt a sense of restriction; it took a few years before I understood that I had needed to enter a new space with new challenges to keep me interested and growing. I feel the same thing now – but for me the expatriate world is comfortable and my home country the challenge! So here’s to new challenges. They may be stressful at times, but they are good. Just remind me of that when I hit speed bump days and can’t remember why on earth I put myself in this situation…! Love the selfie with your sister!! !